Sorry about that, "dal"ing reader. Dal, as you may know, is a staple of Indian cooking. It's kind of like a stew made with legumes, often lentils. I love Indian food - it's rich and spicy and bright and just feels like home cooking. But I haven't made much of it except for a very time-intensive, somewhat authentic, Indian themed progressive dinner years ago. It took days to prepare and a trip to a sweet Indian market for a basketful of bags of spices and jars of curiosities. You know, the kind of meal that once you've prepared - you can hardly stand to look at? So here I go again...but not really. I'm wiser and busier. I have some red lentils and a lovely head of cauliflower. 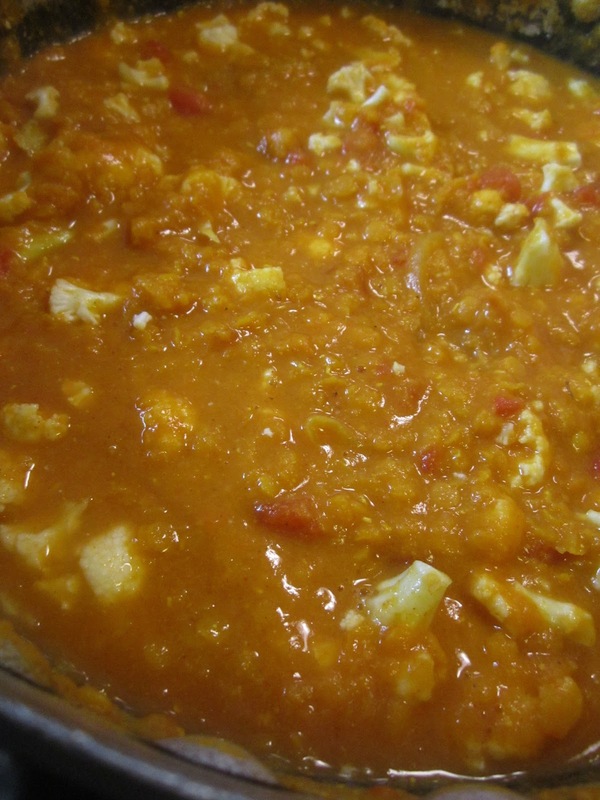 You'll also need relatively fresh curry powder, canned tomatoes, an onion, garlic and a knob of ginger. Yogurt and cilantro to put on at the end really pulls this together, so try not to skip it. Fresh lime juice and chopped peanuts are nice too, but not absolutely essential. Slice onion into thin rings. Mince garlic and grate ginger (a microplane works well). Wash cauliflower and break into bite-sized florets (I like mine tiny - easier to eat and more in scale with lentils). Rinse lentils well and pick out any small stones (I've never found any, but am told they might be in there). Put a large saucepan over medium heat and pour in a little olive oil. Add onion and saute for 5-10 minutes or until softened. Add garlic, ginger and curry powder and cook for another minute. Add lentils, water, tomatoes and salt and bring to a boil. 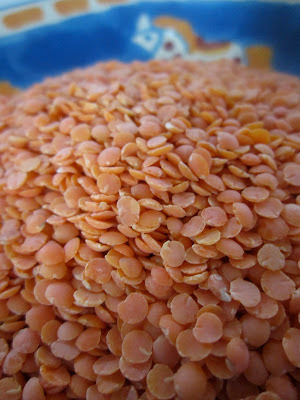 Reduce heat, cover and simmer for 20 minutes or until lentils are almost tender. Remove 2 cups, puree in blender and return to pan. 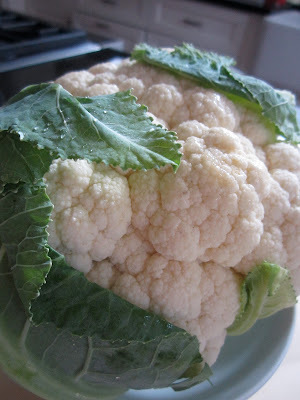 Add cauliflower and simmer for another 20-25 minutes or until tender. 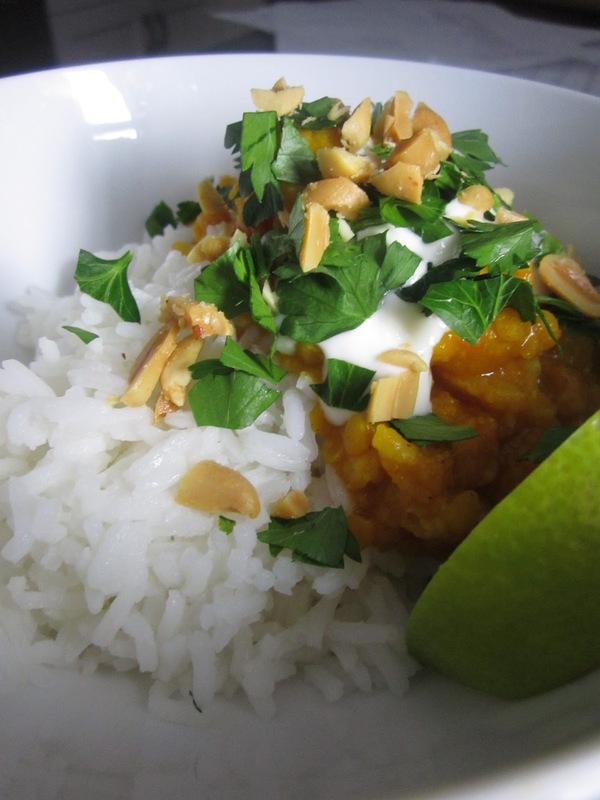 Serve over rice with fresh chopped cilantro, plain yogurt, chopped peanuts and lime wedges.